There are three ways to add more space to your company’s industrial setting. You can either purchase a new facility, you can add on to an existing facility, or you can build a mezzanine. The path that is the most cost-efficient and takes the least amount of time is, by far, building a mezzanine. 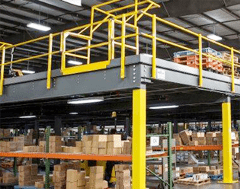 Not only does a mezzanine allow you more space in your facility, but it also helps you save money by being able to get more use out of the facility you are currently in. Mezzanines come in a variety of different shapes and sizes and have a number of different accessories that can be valuable to a customer, including staircases, handrails, gates, ladders, bracing, and flooring. Most mezzanines are custom-built, which helps the customer get the product that will best suit their needs. It is best to consult a professional as you are considering the mezzanine that you need. As a company, S. W. Betz has many years of dealing with mezzanine applications and will make sure that the project is taken care of from beginning to end. In addition to consulting with you about your mezzanine and being able to acquire the materials necessary for a project, the S. W. Betz Company also installs steel mezzanines. The S. W. Betz Company is a preferred distributor for Cogan and Steele Solutions. Cogan has been manufacturing top of the line material handling products since 1901. Steele Solutions is strategically located in Franklin, Wisconsin and has been providing quality material handling solutions since 1996. If you are in need of or would like more information on any of our mezzanines, please contact us and one of our team members will be happy to assist you. For more information about Mezzanines or any other product or service from S.W. Betz, fill out and submit the form to the right.